Facebook: Data Hero or Data Pimp? We are hopefully all aware that brands track us online. We get free content online allowing us to use services like Facebook for free. It might even help us see ads that are more meaningful. Not everyone agrees of course. I have closely followed and written about policy choices for the future of advertising since 1989. Facebook is one of those places where advertisers turn to find you (the technical term is “retarget you”). There are lots of ways this technology can be used. A very common example is a brand builds-up a list of folks who have visited their website within the last 10 or 15 days. They can create many different lists each with some different focus or segmentation; each list is called a Custom Audience. Typically while you viewing a website, a small script is run which triggers a few actions on Facebook — basically adding you to a custom audience list. More advanced uses include adding known dimensions; for example noting that you clicked a particular link, or searched on the site for a particular term, etc. It can include custom data including nearly anything the site knows about you (like you order pepperoni). For example brands can then build up a custom list of everyone who has visited their product page and searched for “Pizza.” They could make another list of folks who have never visited the product page but have also searched for “Pizza.” A brand might simply want a list of everyone (e.g., in the last 4 days) who searched for “Pizza” or a list of everyone who searched for “Pizza” (e.g., in the last 180 days) but hasn’t been back to the site recently (e.g., in the last 14 days). I know a lot of about this type of tracking because this is one of the things I help clients setup. I run campaigns for clients using these tools. 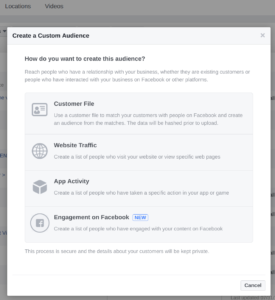 You can learn more about Custom Audiences here. Some of you may be aware that Facebook has a method where you can download copies everything you have posted, all of the photos that you have uploaded, etc. Here is how to do it (link). It now includes the following information. Click to see examples from my Facebook account download on Feb 15th, 2017. I learned about these additions to the downloaded data from this post written Paul Olivier Dehaye on the Art + Marketing blog. You can read more about Paul by checking out his blog — paulolivier.dehaye.org.